When the wind is howling and the snow and cold are blowing in from the Arctic you need a hat that will keep your ears from freezing. This hat is a thick bulky weight that will do just that. Knit in the round, the cuff is cast on in two colors with Old Norwegian Cast On then a row of Double Purl is worked. This technique is originally from Finland. A stranded band adds extra insulation for the ears. These techniques are explained in the pattern. Sizing: When I measure the hat flat it is 20” but it stretches to 24” very easily. Where I wear it, my head measures 24” and it is not uncomfortable. 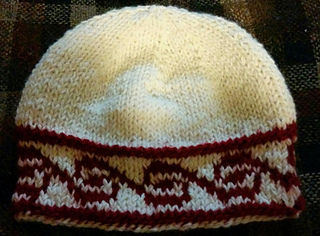 Each repeat of the design is 9 stitches or about 2.75”. You can easily adjust the size by changing the needle size. 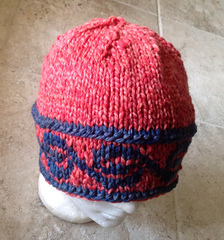 The model is knit with a tighter than normal gauge to add warmth and insulation from the wind. Thanks to all of my testers! Testing thread is here.